We accept payment by PayPal, Visa, Master and American Express cards. Carefully hand-made in Jogjakarta, Indonesia by skillful craftmen, our tjanting tools guarantee you better and easier batik works. The reservoir that holds the wax is made from heavy-gauge pure copper allowing the molten wax to stay hotter for longer. 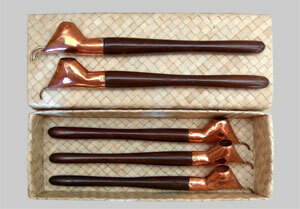 The spout, which comes in 5 sizes, is made of pure brass and the handle is hand-turned from old, recycled teak wood. Some models are fitted with dual-spouts for making lines eventually to be dyed. Notice: We currently don't ship to US, UK and Germany. If you are from these countries, please contact us and we will provide you with the information of our resellers. Customized double spouts with above sizes.